The Boeing 727 is a jet airliner. It is made by Boeing Commercial Airplanes. It can carry 149 to 189 passengers. It can fly for 2,400 to 2,700 nautical miles (4,400 to 5,000 km). The Boeing 727 was made to fly short distances. It can also take off from short runways at smaller airports. It has three Pratt & Whitney JT8D engines. One engine is at the back, and the other two are on the sides of the plane. The 727 is the only plane made by Boeing which has three engines. 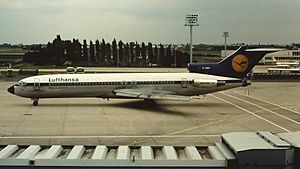 The Boeing 727 was made after the Boeing 707. The 727 and the 707 have some similar features. The 727-100 first flew in February 1963. The first airline to use it was Eastern Air Lines. The 727-200, a longer version of the 727, first flew in July 1967. It was first used by Northeast Airlines in December 1967. The 727 was made during the 1970s. The last 727 was made in 1984. In July 2011, 23 727-100s and 227 727-200s were being used by airlines. The 727 is a very noisy aircraft, so some 727s have been given hush kits to make them quieter. The Boeing 727 was made to fly from small cities which had airports with shorter runways. It also carried fewer passengers. United Airlines wanted a plane with four engines so that it could fly to airports which were at high altitude. An example of an airport like this is Stapleton International Airport in Denver, Colorado. American Airlines wanted a plane with two engines. Eastern Airways wanted a plane with three engines so that it could fly to the Caribbean. The airlines decided to ask for a trijet, which is a plane with three engines. In 1959, Lord Douglas said that Boeing and de Havilland Aircraft Company should work together to make trijets. 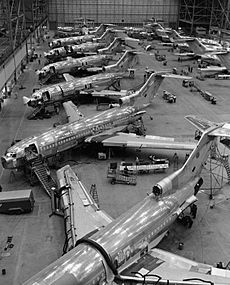 Boeing made the 727 and de Havilland made the D.H.121 Trident. The two planes were quite similar, but the 727 was a bit bigger. Boeing wanted to use Allison AR963 turbofan engines for the 727. The de Havilland plane also used these engines. Boeing and de Havilland sent engineers to look at each other's designs. However, Boeing decided not to work together with de Havilland and changed the engine. In 1960, Pratt & Whitney wanted to sell its new JT8D turbofan engine design. United and Eastern were interested in this engine, so Pratt & Whitney decided to keep designing it. Eddie Rickenbacker, from Eastern, told Boeing that the airline wanted JT8D engines for its 727s. At first, Boeing did not want to use the JT8D for the 727, but it eventually decided to use the JT8D. The 727 has special parts on its wings which help it to make more lift. This means that it can take off from shorter runways than most other jets. Later, some longer 727s were made to carry more passengers. They replaced other jet airliners like the Boeing 707 and Douglas DC-8. They also replaced propeller planes like the DC-4, DC-6, DC-7 and the Lockheed Constellation. Boeing stopped making the 727 in 1984. 1,832 were made. 1,831 of these were given to an airline. The 727 was meant for small airports. This meant that it would have to do without some things like stairs. Boeing built airstairs into the 727. At first, the airstairs be opened while the plane was flying. However, D. B. Cooper, who was a hijacker, jumped out of a 727. This happened while it was flying over the Pacific Northwest. Boeing then changed the design so that the airstairs could not be opened while the plane was flying. The 727 also had an auxiliary power unit (APU). This meant that the 727 could run its systems without any power from the ground. The APU is near the undercarriage. This is quite unusual. Lloyd Aéreo Boliviano 727-200 at Jorge Wilsterman Airport. The rear air stairs are visible at the 727's tail. One thing which allowed the 727 to land on short runways was the design of its wings. The 727 had no engines on its wings, so flaps could be used on the full wing. There were also some other things which made more lift. Together, these things make a lift coefficient of 3.0. The 727 is one of the noisiest airliners. The 727's JT8D engines are low-bypass. This makes them much noiser than high-bypass engines. Boeing thought about giving the 727 quieter engines. They said that the JT8D-200 engine could be used. All 727s being used today need to be given a hush kit. A hush kit is something which makes a jet engine quieter. FedEx makes one of these kits. Over 60 companies have bought this. 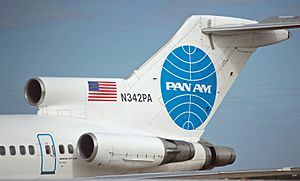 Winglets have also been made for the 727 by different companies. 727s (including 727s which have a hush kit) are banned from some airports in Australia because of how much noise they make. The 727 could fly to different countries as well as to places in the same country. It is useful in airports where the runway is made of gravel. Since the engines are so high up, there is not much risk that they will be damaged by things on the ground. 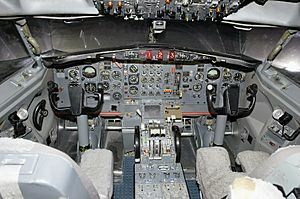 The 727 was also used by the military. Since the airstairs could be opened while the plane was flying, the Central Intelligence Agency used them to put agents and supplies into Vietnam. The Boeing C-22 was used by the Air National Guard and National Guard Bureau to airlift people. Three C-22B's were used. All of them belonged to the 201st Airlift Squadron, District of Columbia Air National Guard. The replacement for the 727 was the Boeing 757. However, the 757 is much bigger than the 727. Because of this, some airlines replaced the 727 with the 737-800 or the Airbus A320. There are two types of 727. The first one is called the 727-100. Airlines began to use it in February 1964. Airlines began to use the next type, the 727-200, in December 1967. 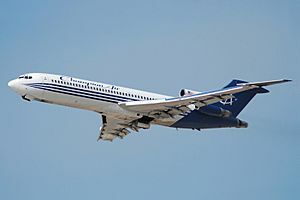 The 727-100 first flew on February 9, 1963. United Airlines got the first plane on October 29, 1963. 571 727-100s were made (407 -100s, 53 -100Cs, and 111 -100QCs). The last one was made in October 1972. Boeing kept one 727-100. This means that the real number is 572. This type could be changed into a cargo plane and into a passenger plane. QC stands for Quick Change. This is a 727-100C which can be changed into a cargo plane much quicker (in 30 minutes). QF stands for Quiet Freighter. It was made for the United Parcel Service. The 727-200 is a longer version of 727-100. The -200 is 20 feet (6.1 m) longer (153 feet, 2 inches, 46.7 m) than the −100 (133 feet, 2 inches, 40.6 m). 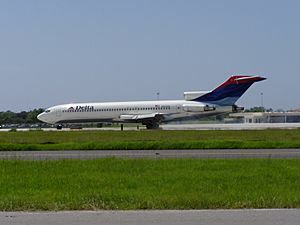 The 727-200 first flew on July 27, 1967. Northeast Airlines got the first 727-200. 310 727-200s were made. The 727-200 Advanced replaced the 727-200 in 1972. This type can fly for longer. It also has some improvements in the cabin. A type of 727-200 Advanced which could carry cargo. This type has 50 mph (80 km/h) more speed. This happened because the engines were replaced with more powerful ones. It also had winglets. This type was first made by Valsan Partners, but Quiet Wing Technologies in Redmond, Washington, began to make it later. 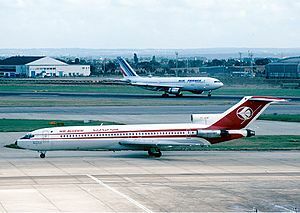 The 727 has been used by some governments. The Belgian, Yugoslavian, Mexican, New Zealand, and Panama air forces have used it. The United States military also used the 727; it was called the C-22. 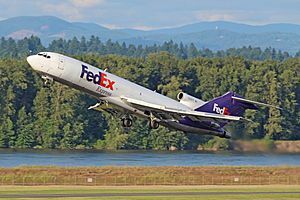 As of 2010, the Boeing 727 has had 325 accidents. It has had 112 hull-loss accidents. 3,783 people have died in these. 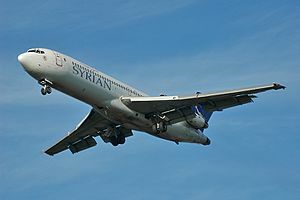 The 727 has been hijacked 178 times, and 345 people have died in these. Boeing 727 Facts for Kids. Kiddle Encyclopedia.